It's not over until the last Walker falls. In a move that should shock absolutely no one, AMC has renewed its flagship post-apocalyptic horror-drama series The Walking Dead for a tenth season. The network made the announcement through the official Twitter page for The Walking Dead, sharing a video asking fans to "listen closely." Just 20 seconds in length, the footage shows a pack of Whisperers — humans who cloak their faces and bodies with zombie skin in order to blend in with the Walkers — moaning and groaning as text that reads "S10 OCTOBER" slides across the screen. The Walking Dead showrunner Angela Kang shared the same video to her Instagram page on Monday, adding in the caption, "Season 10! #twd #thewalkingdead." So, there you have it, kids: The Walking Dead season 10 is coming to AMC in October. Strap in, whether you're ready or not, because more zombies are a-coming. 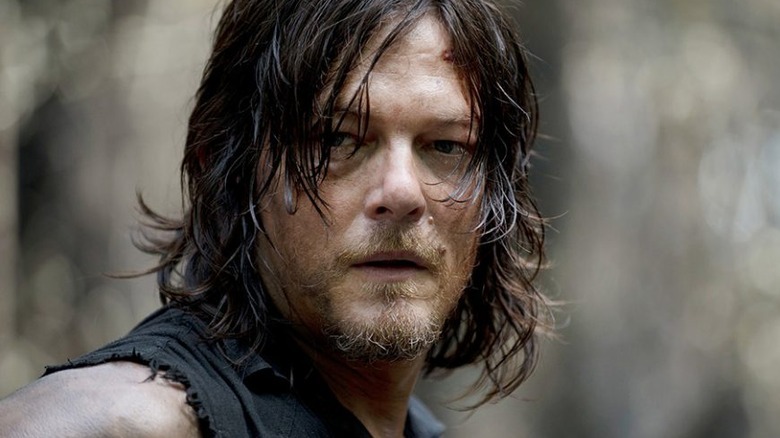 Currently in its ninth season, The Walking Dead has faced some hard times and undergone big changes in the last year. Lead actor Andrew Lincoln walked away (pun intended) from his post as Rick Grimes, the former King County Sheriff's Deputy who led the Atlanta Survivor Group and Alexandria Safe-Zone and helped rally the Militia after the apocalypse ravaged the world, after spending the better part of a decade playing the character. Lincoln, a native Brit, revealed in July of 2018 why he was exiting The Walking Dead: he could no longer bare to spend so much time away from his family. "I have two young children, and I live in a different country, and they become less portable as they get older," he explained. "It was that simple. It was time for me to come home." Prior to Lincoln's departure, the actor's on-screen son, Chandler Riggs, left the show. Riggs' character, Carl Grimes, was killed off after being bitten by a Walker in the mid-season finale of The Walking Dead season 8. Entitled "How It's Gotta Be," the episode marked the beginning of the end of Carl, who died in the mid-season premiere of the series' eighth season and made his last appearance as a corpse in "What Comes After," the fifth episode of the ninth season of The Walking Dead. Riggs' exit ruffled some feathers — but none more than those of his own father, who claimed Riggs was fired from The Walking Dead. "Watching [former showrunner Scott M.] Gimple fire my son 2 weeks before his 18th birthday after telling him they wanted him for the next 3 years was disappointing," Riggs' father, William, posted on Facebook. "I never trusted Gimple or AMC but Chandler did. I know how much it hurt him. But we do absolutely know how lucky we have been to be a part of it all and appreciate all the love from fans all these years!" The actor assured that his departure wasn't a firing, saying of his impending exit prior to when it actually happened, "It's definitely not a bad thing because it has been awesome being on the show but now I get to go and do a lot of other stuff that I haven't gotten to do before … Thank you to all the fans for giving me a job for eight years and for giving me this amazing experience and blessing me with this career and this chance at having so much opportunity." Lauren Cohan's Maggie also left The Walking Dead in November of 2018, reportedly due to contract and salary disputes that led her to sign on for the ABC drama Whiskey Cavalier. She told the Associated Press that she had gotten "too comfortable" in her role, and that she knew it was time to leave. "Eight years is a really long time to be in those emotional depths and it's really fun for me because I never thought about drama as much when I started this career and I always kind of assumed I'd do like light fare," explained Cohan. "There's a chance for me to still explore the Maggie character and it's going to be fun to see if that can be done." From season 8 to season 9, The Walking Dead skipped forward in time — but the time jump didn't translate to a jump in ratings. Viewership has been steadily declining, and many fans have given up on the show entirely, quitting keeping up with it for a variety of different reasons. There's no telling whether The Walking Dead season 10 can turn things around, what it might entail, or how it might make up for the loss of Rick, Carl, and Maggie (as season 9 has yet to wrap up as of this writing), but AMC would be wise not to keep the series running for too much longer. The last thing anyone would want The Walking Dead to become is a show that would have been better if it ended earlier. AMC hasn't set an official release date for The Walking Dead season 10, though it is scheduled to premiere sometime in October.